This latest project from Streetcar offers a wide mix of units ranging in size from one bedrooms to family-friendly three bedrooms, dramatic glass window walls, dynamic angles and innovative green roofs to integrate within the surrounding neighbourhood while reflecting environmentally sustainable design. A public square will anchor the development and feature a mix of smaller and larger retail spaces fronting Queen Street that will include a grocery store, cafés, restaurants and an assortment of shops and commercial spaces. Riverside Square is at the heart of an exciting and evolving neighbourhood that pulsates with life day and night. Designed by acclaimed architectural firm RAW Design. A collection of five buildings located in the heart of Toronto’s Riverside Community, located at Queen Street East and the DVP. Riverside Square, the shape of things to come. It’s time to think inside the square. Riverside Square. A community at the edge of Queen East and DVP. A community inspired by its rich heritage and modern amenities. Meet up with friends in the vibrant outdoor square. Dine al fresco as the sun goes down. Work up a sweat in the state-of-the-art, fully equipped fitness centre. Entertain your guests in style in the sleek private party lounge. Enjoy spectacular views from the rooftop swimming pool and sun deck. Active, hip, community-oriented. Riverside Square is what condo living was meant to be. 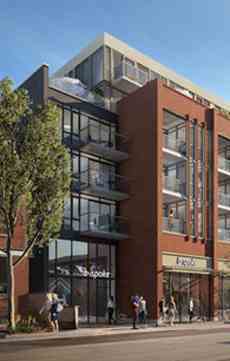 Riverside Square Phase 5 is a condo development by Streetcar Developments located at 677 Queen Street East, Toronto. Riverside is a neighbourhood rich with history. From the iconic Queen Street bridge to the former factories that still stand as a reminder of the area’s industrious past to the legendary Broadview Hotel – this is a neighbourhood proudly shaped by yesterday’s stories, and calling out for new stories to be written every day.